The Nutting family gathered with Carolyn Hollendonner, center left, widow of Fran Hollendonner, during the WVPA Hall of Fame induction for the class of 2013. Lyell Clay and Hollendonner were inducted. Hollendonner spent a large portion of his career with Ogden Newspapers. Ogden Nutting, at left, spoke about Hollendonner during the event. 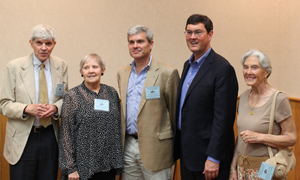 Other Nutting family members include, from center to the right, Bill Nutting, Bob Nutting, who spoke about the future of newspapers during the President’s Reception, and Snookie Nutting, Ogden’s wife and Bill and Bob’s mother. 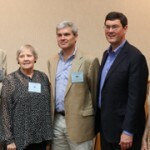 Ogden Newspapers CEO Bob Nutting and the Nutting family are featured in a Sunday piece by the Pittsburgh Post-Gazette. Nutting looks at the big picture with Pirates. NOTE: Bob Nutting is a past president of the West Virginia Press Association. Odgen Newspapers publishes the Wheeling News-Register, The Intelligencer, The Weirton Daily Times, The Journal in Martinsburg, The Inter-Mountain in Elkins, The Parkersburg News and Sentinel, The Wetzel Chronicle, The Tyler Star News and The Shepherdstown Chronicle in West Virginia.